Shooters head to the range at the Fort Roberdeau 18th Century Marketfaire and Rifle Frolic. In 2012 when the idea of the Ft. Roberdeau 18th Century Marketfaire and Rifle Frolic was brought to the National Muzzle Loading Rifle Association by Village Restorations and Consulting Inc. it fell to me to figure out what the NMLRA was going to do with our end of the event. Roland Cadle and Pam Raub from Village Restorations had contracted the historical Ft Roberdeau for an 18th Century Marketfaire. They have done 18th Century Marketfaires before but they wanted the expertise of the NMLRA to run the shooting on the gun club’s ground next to the Fort. Altoona Rifle and Pistol Club at the time was not a muzzle loading shooting club. They shoot shotgun block shoots every Tuesday night through the winter and that was about it for activities. They do have ranges out to three hundred yards and several pistol ranges on their property. Contracts were signed and agreements were made and the first year shoot was held Columbus Day weekend 2013. Bob Voegele was the NMLRA president when it was thought of and permission given to do it and then NMLRA President Becky Waterman was president when the first event happened. She attended the first one and everyone since its inception to date. John Getz of Getz Barrel Company ran the woods walk the first year of the event. The Rifle Frolic in 2013 only had 38 competitors and would lose about $700. First time shooters are given an opportunity shoot muzzle-loaders for the first time at this event. A lot was learned from that event and the next year, 2014, there were about 80 shooters and $700 was made in profit. Then is when we figured out to make a real profit a raffle had to be put into place. In 2015 a reproduction Brown Bess Musket was raffled off and the number of shooters was around 90 but the profit went over $1000 for the first time. 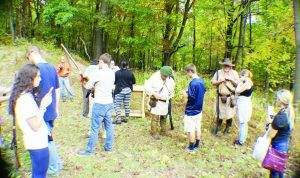 In 2016 Ft. Roberdeau wasn’t able to host the 18th Century Marketfaire so the vendors were invited to set up at Altoona Rifle and Pistol Club. Mike Eder and his mother Anne from Flintlocks LLC that year would set up their store at the 18th Century Marketfaire and Rifle Frolic for the first time. They have come back every year since and the locals are starting to look forward to their arrival every October. From 2013 to 2018 there have been constant range improvements. Loading tables built, ranges made larger and the constant search for prizes. One hundred and 30 prizes where given out to shooting competitors at this year’s event. Other events such as the camp tomahawk throw had that many prizes given just for the one event. Some prizes as small box of pastries or two liter bottle of soda and even gift cards were given in the camp tomahawk throw. The camp tomahawk throw is simple; everybody is invited and you get in line and walk around in a circle throw the tomahawk; simple rules: if it sticks you pick a prize off the table and stay in line and if it doesn’t stick you also stay in line and try again. You keep going until all the prizes are gone. Some people won three or four prizes; some never did get their hawk to stick. Two things I didn’t mention: one you got to hold your prizes while you throw the next round, if you drop it goes back on the table. When all the prizes get picked from table you keep throwing another round (or more)—the person running it determines that—and if you stick you get to steal somebody else’s prize. The white envelopes where popular to steal because they had gift cards from $10 gift certificates at a larger retail store to a free French fry at a fast food place. Everybody who was registered in camp was eligible to do this. Many watched but I am sure they will do it next year. By the way I grabbed a box of oatmeal cookies and they weren’t stolen. The 2018 NMLRA Ft Roberdeau Frolic was the most successful to date. There were 120 participants at this year’s event. There were actually 111 registered muzzle loading shooters. There were 552 paper targets shot, there were ten different paper aggregates shot: One-Gun, Offhand, 3 shot turkey, Hunter’s, Ladies, Juniors, Trade gun, Sighted Smoothbore, Pa Deer Legal, Pistol. The Table Shoot which is also shot at paper for meat prizes is a daily match. The largest amount of people who shot the Off Hand aggregate had 37 shooters. This was followed by the 3-shot Turkey Offhand Aggregate which had 30 shooters. This match consisted of two 25-yard three-shot turkey head paper targets and two 50-yard three-shot turkey head targets. The next most popular paper is PA Deer Legal with 19 people shooting in that match. This match is for any muzzle loading rifle allowed in a Pennsylvania muzzle loading season. That means that one needs to shoot a .45 caliber or larger ball or bullet using a scoped or iron sight, any ignition including in-line. Two paper targets are shot at 30 yards, a running rabbit and a standing buffalo. This match was an in-line-only match and never got more than five shooters, many standing there in primitive clothes shooting the scoped in-lines. So the match was opened up to PA Deer Legal. 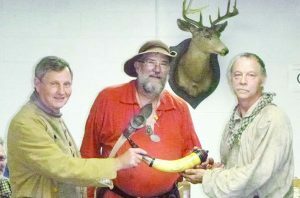 Left to right: Roland Cadle, maker of the Ephraim Brank Horn; author Jim Fulmer and the 2018 winner and winner of the horn for all time, Gary Delcone. This year was the most ladies we ever had shoot with ten shooting. We do pay back 5 places. The winners where Sara Hardesty with a score of 89, Shannon Lewes 83, Lisa Golough 81, Connie Hope 78, and Karen Roach 71. I hope we continue to see it grow. We need more Junior shooters, period. We need more muzzle loading Junior Shooters. Over the years have tried many things the best did but we only did once we had a Junior indoor air rifle match the day of the shoot and had about 15 competitors mostly Scouts and about 5 or more who shot well with the air rifle went up the hill and entered in the muzzle loading shoot. Guess what? They shot well with muzzleloader also. This year we only had 4 juniors and the winners were Caleb Engle score of 65, Chris Stine 48, Elisha Casarrubias 29, and Nate Casarrubias 19. Next year I will try and get an air rifle match set for the indoor range on Saturday to introduce more local juniors to the event. There is also a Woods-walk shot every day. It has grown to 40 shooters every day. Jerry Heister runs the woods walks and there is always something new and different. Making shooting fun is what it is all about. It is the second most popular event with the “Iron Valley” being number one with 59 different registered shooters shooting it over the three days. Iron Valley is like it implies mostly Iron Targets shot from the same firing line going up the “Valley.” Usually there is around 12 targets and the groundhogs, the buffalos, a dueling tree and a sun. A moon, a hostage, and many other targets are woven into a story that has been different for all six years and I am sure it will be different in 2019. It is fun and a must shoot event. If nothing else, you come away with a different story. Curt Fulmer spins the story and Wes Griest helps to make it happen. The Tim Murphy and Ephraim Brank matches where two very popular matches that kept getting bigger every year. This year there was 30 plus shooters in each match. The matches where based on historical shots made by the two men for whom the matches are named. They are long range muzzle loading at its best. The idea was Roland Cadle’s to shoot these matches. He made a beautiful custom powder horn for the Ephraim Brank Match and Art DeCamp made the every bit as nice horn for the Tim Murphy Match. This year was the last year for these matches. The horns had five spaces on them for five winners. The idea was whoever won the horn the three out of five times wins the horn. If nobody was a clear winner the names would be put in the hat and drawn. The Tim Murphy was won three times in a row early on by Don Blazer. But the Ephraim Brank had five different winners with Gary Delcone winning it this year. So all five names had to be put in the hat and the one was drawn. The winner was Gary Delcone. Believe me the hat was shook up and that is the official result; it was just meant to be his horn. Because of the logistics for this match every year the woods walk was shut down for a half day on Saturday to make these events happen. Starting next year these two events will be retired and a similar long range match will be called “Kings Mountain.” It will be similar to Iron Valley with all steel targets but it will recreate the Battle of Kings Mountain. It will be period dress clothing and flintlocks only in honor of “Sweet Lips”. A major shooting event has important social connections. 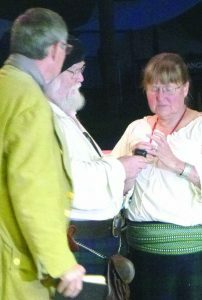 Here Roland Cadle is not only a horn maker but is a minister and renewed the wedding vows of Michael and Karen Roach at the 2018 NMLRA 18th Century Marketfaire and Riflefrolic. Primitive archery with its 3-d course and shooting inside the club house at night with the primitive bows is growing more and more every year. Joe Ling filled in for Paul Smeltz who had gotten hurt in a motorcycle accident just before the event. Paul is fine and hopefully both will be there next year. Every year the primitive archery range gets bigger. This year there were 40 archers on Saturday. Growth is the key and we need to grow. What I am trying to do in this article is tell why I believe this event is growing and what the NMLRA has done to grow this event. First the event is not a rendezvous. 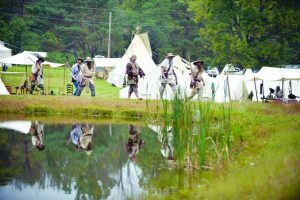 It has pre-1840 rules in the primitive camp like Rendezvous but it is a Rifle Frolic First. Of all the match competitions only three are period clothing only. You can be dressed in baseball cap and blue jeans and shoot in every match but three. Only two are flintlock only and they are also part of the three matches you have to be dressed pre-1840. All are welcome to shoot and camp. There is a place for modern tents and modern trailer and RV campers to park. The primitive is growing every year. The reason I feel there is success is the one price rate of $45 camping and shooting for three days. Non-shooter camping is $30, day shooter $20 with $35 for weekend covers all of the matches in which you are eligible to compete. Children younger than 16 camp for free with registered adult; under 16 shooting fee is $1. To attract shooters you need a varied course of fire and it has to be fun. Of the 111 shooters Iron Valley draws the most but that is still only 59 shooters, a little over half of the total number. Then the woods walk and the paper offhand matches draw around 40, just over 1/3 the total number of shooters. Looking through the matches roughly one third shot paper, one third shot iron targets and about one third shot some of each. But one thing they all wanted to do and I hope they did was to have fun.